It’s not too early to start planning a trip to Italy, especially if you are thinking – wisely – to go during one of the ‘shoulder seasons’. And if that country is in your plans in 2011, you may like to have some information on that famous and unique city, Venice. In this story Nancy Macdonald has a Venice-based book recommendation which you may welcome to while away some winter hours before your travels. “Would Venice hold the same magic on a return visit?” I wondered as I drew close to the fabled city. Yes, indeed it did. 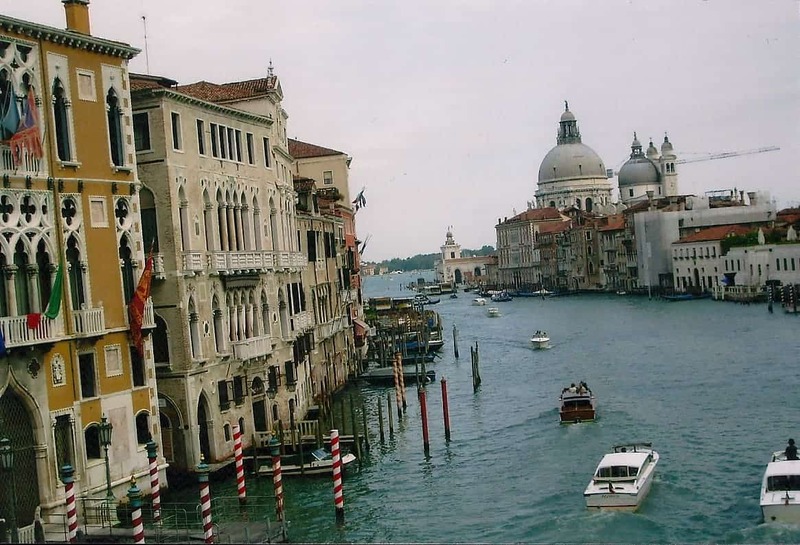 On this trip, I had a theme: discovering the Venetian sites described in the novel Miss Garnet’s Angel, by Salley Vickers, which I had greatly enjoyed. After three days, I felt as at home in the Campo Angelo Raffaele as the book’s protagonist – Julia Garnet – did after three months. She came to Venice as a repressed, retired teacher who took advantage of an inheritance. 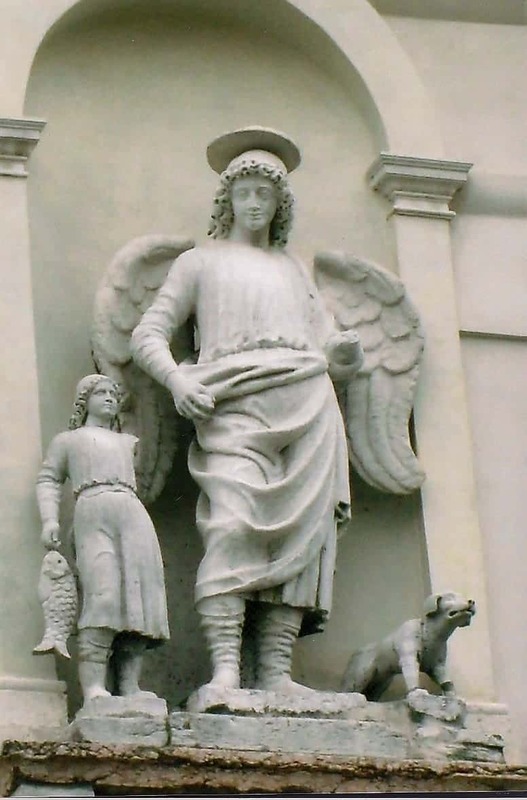 There she discovered life and love under the watchful eyes of the statues of the Angel Raphaele, a boy with a fish and a dog that adorn the 14th century Chiese (church) dell’Angel Raphaele. And the experiences she had led me to sites that are not usually on the ‘first time in Venice’ list (although, of course, she did those too). I arrived by train from Rome and found the Information Booth in the station helpful. They sold a map and guide in English that was all I needed. Then you mount the waterbus and the adventure begins. The traffic of taxis, waterbuses, motorboats, luxury liners, a sailing ship and the gondolas crowded the canals of Venice just as the cars and motorbikes do the streets of Rome. Complementing Julia Garnet’s tale is a parallel story from the Apocrypha that adds another layer to the novel. Scenes from this story are shown in a long panel in the above-mentioned Chiesa dell’Angel Raphaele. Most churches are open with many charging admission. If you are a real art lover, I’d suggest bringing small binoculars to see the details in the church art. A short walk to the water and along the Canale Della Giudecca offered some restaurants with views of the passing water traffic. I walked this route most days to the side road leading to the Accademia Gallery and the graceful wooden bridge that is one of only two that cross the Grand Canal. You will soon learn to use the waterbuses to explore. I had bought a one-trip ticket for €6, good for several hours, but 12-hour, 24-hour and 3-day passes are also available. You get them stamped on your first journey. I joined the photographers on the Accademia bridge and admired the 17th century church, Santa Maria della Salute (Good Health), at the mouth of the Grand Canal. And I stopped near the bridge to tour the Gallerie dell’Accademia. Here great Venetian painters are represented: Belini, Tintoretto and Carpaccio. I had not heard of Carpaccio until I read that Miss Garnet fell in love with his paintings. I did too. Back on the bridge, you will see a modern white building along one side that is home to the Peggy Guggenheim Collection in the Palazzo Venier dei Leoni. A short talk in English told about her tastes and her desire to share her art collection with the public. We also saw the gravestones of her ‘babies’, the dogs who shared her life here. I enjoyed her taste in modern artists although she claimed she knew nothing about art but just kept buying! I took a picture of the sculpture of the priapic boy on a horse, another of Miss Garnet’s discoveries. Back on the bridge again, you will see, on the far side, the beautiful yellow and white Palazzo Franchett, first built in the mid 15th century. The ticket booth is on the second level, up a monumental, beautifully decorated staircase associated with the period when Sarah Luisa Rothschild, wife of Baron Francetti, lived here.